Where were you when you heard the announcement about the birth of the Royal Prince? Rotaract were in Sweeney & Todd’s Pie Shop in Reading, on European Pie Approximation Day, 22nd July (22 divided by 7 is 3.14). That should be a good story to remember! 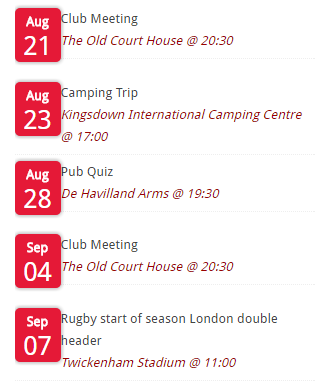 July has been incredibly busy with charity events, cinema trips, sports etc. We had a good turnout for Picnic to Music in the Park, and for those of you who don’t know, yours truly got to go up on stage and be interviewed about Rotaract for a couple of minutes by the Compere. A great opportunity to advertise Rotaract to 5,000 people – but a bit nerve-wracking! We have chosen two local charities for the coming year: Christopher’s Smile, who raise money to help fund research and testing drugs to fight cancer in children, and Surrey Search and Rescue, an organisation that helps find missing children and vulnerable adults in Surrey with teams of volunteers with trained search dogs. Did you know Surrey is England’s most wooded county? We have also decided to raise a single sum of £275 to buy an eco-composting toilet for a family in Africa or India, through the charity ‘Wherever the Need’. Planning is underway for our Barn Dance, which will raise money for our two local charities, and will be on Saturday 21st September in Collingwood College. Any raffle prizes would be very welcome. And finally, we took advantage of the fantastic weather to have an outdoor games night, which worked up a good appetite for a round of desserts on the outdoor deck of the Heron on the Lake, and seeing a couple of outdoor movies with Pop-Up screens that hold events in various outer London parks: in our case Back to the Future and Labyrinth – classic 80s films, even though some of the younger members weren’t even born in the 80s!